BlogWhat Do Salamanders, Texas And The OA Have In Common? You’ve heard of the “King of the Jungle” and Lord of the Flies, but how about “Savior of the Salamanders”? No? Well, you might know him better as national chief. 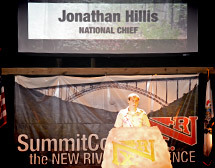 Meet Jonathan Hillis, the 2011 national chief of the Order of the Arrow. He basically managed the entire SummitCorps project as the head youth leader. But before he was elected as national chief, Hillis was named “Savior of the Salamanders.” So how does one earn such a title? For Hillis, it all began with his Eagle Scout project. As the son of a biology professor, Hillis has a certain affinity for environmental studies. He chose to develop conservation efforts for the highly endangered Barton Springs Salamander (Eurycea sosorum). Interestingly, his own father, Dr. David Hillis, discovered the species. Have a Vigil name? Let us know in the comments below.